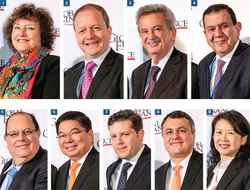 In our October issue, Global Finance presents its latest annual grading of the world's central bank governors. Here, we present the nine who received an "A" grade in 2017: those from Australia, Honduras, Israel, Lebanon, Morocco, Paraguay, Russia, Taiwan and the United States. Infrastructure: Can It Rebuild The Global Economy? Bridges, ports, roads and dams: Infrastructure investment is having a moment in the sun. But will it rise to the high hopes so many have that it can rebuild crumbling economies around the world? Which countries lead the global knowledge economy? At least one academic suggests that current assessments of a country’s knowledge base are too narrow and reliant on averages. In research to be presented in April at INSEAD, Kai Chan argues that a nation's brightest talent—not its average capabilities—determine its knowledge capacity. A 35-page essay in the archives of the US-China Economic and Security Review Commission shows how Robert Lighthizer, a veteran attorney who is now Trump’s pick for US Trade Representative, might approach America's $30 billion-a-month trade deficit with China. U.S. lawmakers are upset with China. Again. Is This The End Of Globalization? From Occupy Wall Street and the Arab Spring to surprising victories for Brexit and Trump, citizens around the globe are pushing back against their leaders’ policy choices. As the commercial world becomes more litigious, individuals and corporations are increasingly hamstrung from pursuing justified legal claims by a lack of liquidity or other means of financing. PNC Bank’s head of retail banking and chief customer officer, Karen Larrimer, details how to match customer needs with technology. The banking industry’s leading lights have largely adjusted their business plans to a world of tighter regulations, higher capital requirements and less leverage. Now, they are taking on new competitors by embracing the very information technology that has disrupted their business. Uncertainty over the future has grown, while growth forecasts have been cut. The republic of Trinidad and Tobago girds for austerity as oil brings in less foreign exchange. The question this year for investors in China is whether the government will continue moving toward a free-market economy—or keep grabbing the wheel. Has Italy Turned A Corner? The foundations for economic recovery have been laid by Matteo Renzi’s government, which is tackling fundamental issues at the heart of Italy’s problems. But he has yet to work his magic on public spending. Can Colombia Count On A Peace Dividend? Low oil prices are widening Colombia’s current-account deficit, dampening the confidence of foreign investors and dragging down the economy. A new era kicked off on December 31, 2015, for the 10 countries that are part of the Association of Southeast Asian Nations: The alliance launched the Asean Economic Community (AEC), a trade bloc aimed at creating a unified, cross-border market where labor, services and capital can flow without restrictions. South Africa: After burning through two Finance ministers in 18 months—with the second having held the job for less than a week­—South Africa’s president, Jacob Zuma, moved in mid-December to restore a measure of stability to the post. Brazil: The Banco Central do Brasil gave new Finance minister Nelson Barbosa a bit of help on January 20, when it decided to hold the short-term interest rate, the Selic, to 14.25%. Tsai Ing-wen, leader of what was—until a couple of weeks ago—Taiwan’s opposition party, will become the island’s first female president this spring following a January 16 election in which she and her Democratic Progressive Party (DPP) won control of both the presidency and the legislature from the incumbent Kuomintang (KMT) party.